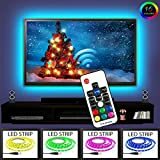 It might seem odd if you’ve never experienced this for yourself, but I don’t think I can ever go back to watching TV at home without the EveShine Neon Accent LED Strip Bias Backlight. The kit consists of an LED light strip that plugs into the USB port on the back of your TV. Then anytime the TV is powered on, the light strip glows on the wall behind your TV. You can adjust the color and brightness using the included remote, and the results are absolutely gorgeous. It also makes watching TV so much easier on your eyes, so it really is a win-win. Relieve Your Eye Strain – Quality Bias Lighting can help reduce the eye strain caused by long exposures to TV screens and monitors in dark rooms. It can also help make the grays and blacks on your screen seem richer.